CEP has identified three major categories where YouTube has failed to meet its own goals for the swift removal of known terrorist content: bomb-making videos, violent ISIS videos, and extremist influencers. The presence of this content poses a continued risk to public safety. CEP has repeatedly discovered an ISIS video with English subtitles released in November 2016 that offers step-by-step instructions for building a homemade anti-personnel bomb with easily and legally acquirable components. According to a June 24 article from the London-based Times, Manchester suicide bomber Salman Adedi viewed this video on YouTube to help construct his device which killed 22 people and wounded 250 others. While YouTube has removed specific versions of this video, duplicates were re-uploaded to the website on June 24 and July 18. It can take an average of five minutes for an individual to download a video for the purpose of storing the video and re-uploading it at a later date. If YouTube was sincere about its commitment to deploy hashing technology, as the company so claims, this instructional bomb-making video could not have been re-uploaded in the first place. ISIS videos—both those depicting violent executions, and those used by the group to spread propaganda—continue to be readily available on YouTube. YouTube has improved its response time since ISIS posted its first beheading video on the platform almost three years ago, but videos depicting shootings, beheadings, and suicide bombings can still be found consistently on YouTube, with some of these videos remaining live for days or weeks at a time. In some cases, YouTube has allowed violent content—like the execution of Jordanian pilot Muath Safi Yousef Al-Kasasbeh—to remain on its platform while putting an age-restricted warning label on the video, instead of immediately taking the video down for violation of terms of service. 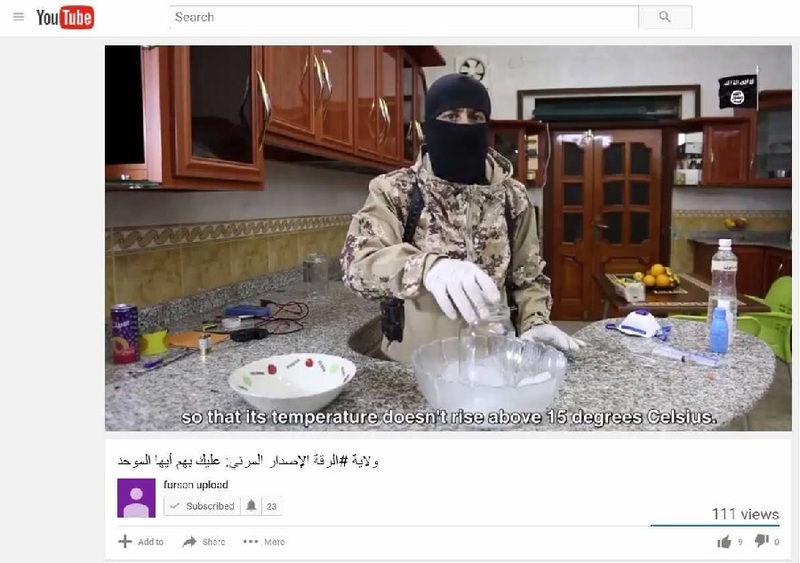 As a result of YouTube’s piecemeal approach to removing terrorist content, YouTube remains a favorite destination for ISIS’s news updates from official and semi-official outlets like Amaq and Muta News Agencies. The issue goes beyond matters of propriety, and begs the question; what steps has YouTube immediately implemented to prevent terrorist organizations from using its platform to disseminate threats and propaganda. Google and YouTube must clarify its position on how the company will prevent the continued, systematic re-uploading of known terrorist content. In addition to videos previously described, YouTube continues to allow an extensive array of videos by extremist influencers and preachers who use the platform to recruit and radicalize others. Unfortunately, many of these influencers have successfully used Google’s platform to reach their target audiences, and have influenced extremists to attempt or carry out acts of terror. Anwar al-Awlaki: Anwar al-Awlaki has played a role in radicalizing dozens of U.S. and European extremists to attempt or carry out acts of terrorism. As CEP has found, videos of the notorious radical cleric Anwar al-Awlaki are still widely available on the website. After tracking the presence of Anwar al-Awlaki content on YouTube for two years, CEP has found that Awlaki content is consistently—and in some cases increasingly—available on YouTube. Search results for “Anwar al-Awlaki” on YouTube, for example, have risen from around 60,000 in December 2015 to more than 80,000 in June 2017. Despite Google’s claims to have meaningfully reduced the volume of extremist content on its platform, Google has yet to take a principled approach to the presence of Awlaki’s radicalizing lectures on its platform. For example, CEP found that a search for “Anwar al-Awlaki jihad” revealed only a nominal reduction, from 8,400 search results in December 2015 to 7,590 in June 2017. Other Extremist Preachers on YouTube: Videos of lectures by U.S.-based preacher Ahmad Musa Jibril are also still available on YouTube. Jibril is notorious in part due to his popularity with ISIS foreign fighters in Syria, with an estimated 60 percent of them having followed him on Twitter, according to early estimates by ICSR. Most recently, one of the suspected terrorists in the June 2017 London Bridge attack was found to have watched Jibril’s online content. As of July 2017, Jibril’s YouTube page, https://www.youtube.com/user/AhmadMusaJibril/, remains live on YouTube and has amassed more than 16,500 subscribers. Videos by another influential extremist preacher, British-born Abu Haleema, are also widely available on YouTube. The U.K. government banned Haleema from operating on social media platforms in 2015, but Haleema only had his videos blocked in that country following the London Bridge attack. Like Jibril, Haleema’s online lectures reportedly played a role in the radicalization of one of the June 2017 London Bridge Attackers. Nonetheless, his videos today remain readily accessible outside of the United Kingdom. A YouTube search for “Abu Haleema” yielded 13,600 results in July 2017, with one YouTube channel operating on his behalf having gathered more than 520,000 views. On July 20, 2017, Google formally announced the launch of its Redirect Method on YouTube, a program designed to identify users searching for ISIS-linked content on YouTube and expose them to advertisements and video playlists on YouTube that run counter to ISIS’s narratives. Google highlights statistics purported to demonstrate how many YouTube users were “reached” and the amount of “minutes of video” users watched. The foregoing are metrics for measuring the efficacy of digital advertising – not for a counter radicalization program. For example, no information is provided about the individuals who watched the videos or whether or not any of them were, in fact, even on the path to radicalization. One counter-narrative playlist designed by Google to undermine ISIS narratives, “Answering the Call,” was presented as an example of a successful case study for the Redirect Method. Although the video “reached” more than 100,000 viewers, the video was overwhelmingly unpopular among its viewing audience—receiving 57 dislikes compared to only 12 likes. Concerns about the Redirect program aside, the facts remain that counter-narrative content and voices continue to be drowned out by the high volume of extremist material on YouTube that remains readily available. Google’s stated desire to reduce the terrorist recruitment threat on its platform continues to be contradicted by its persistence in hosting and promoting content by extremists including al-Qaeda recruiter Anwar al-Awlaki, a man whom former U.S. president Barack Obama deemed too dangerous to live, and who had played a role in radicalizing nearly 90 U.S. and European extremists. Until Google takes the definitive step of permanently removing terrorist recruitment content, YouTube will continue to be the go-to source for those on the path to self-radicalization and terrorist violence.